Are you having trouble with your refrigerator ice maker not working properly? This can be extremely frustrating, especially when you have to pull open the ice reservoir and dig around for your ice. Luckily, there are usually only a handful of reasons why your ice maker won’t produce ice, so it shouldn’t be too difficult to diagnose the problem. The first thing you should check when there’s a problem with your fridge’s ice maker is the temperature control. If the temperature in the freezer is above 10 degrees Fahrenheit, it won’t be able to make ice properly. Look for the temperature control knob in either the fridge or freezer cabinet and verify that the temperature is set correctly before checking the other problems on this list. It may seem silly, but it happens more often than you would think! The next thing to check is the water pressure to your fridge. Most ice makers will require at least 40 psi to produce ice. 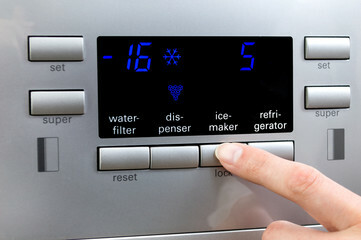 If your water pressure is below 40 psi, you may need to take steps to remedy the water pressure to use your ice maker. A repair professional can tell you the various ways you can boost the water pressure to your refrigerator. When was the last time you changed your water filter? All of the water that goes to your refrigerator’s ice maker comes through the filter. Over time the filter becomes clogged and will restrict the flow of water to your refrigerator. On top of causing your refrigerator ice maker not working issue, a clogged filter can cause a variety of problems for your refrigerator. It’s important to replace your filter every 6 months. Another common reason for a malfunctioning ice maker is frozen water lines on the back of the refrigerator. If the coils get too cold, it can freeze up the lines making it impossible for water to flow freely. You can fix this by using a hair dryer to heat up the coils on the back of your fridge. Make sure to put a towel down underneath to catch the dripping water. Once you’ve melted any frozen spots, make sure you bump the temperature up a little bit on the temperature control to keep it from refreezing. Sometimes water flow is blocked due to debris caught up in the water inlet valve that leads into your refrigerator. You can fix this by cleaning out the screens on your water inlet valve. Start by looking up where the water inlet valve is on your particular model of refrigerator. Turn off the water lines that lead to the fridge before you remove the hoses from the water inlet valve. Once the water is off, remove the hoses, and gently clean out any sludge or debris that’s clogging up the screens. Re-attach the hoses and turn the water back on. Check to make sure water is flowing to your fridge. If you’ve gone through our whole list and you still notice your refrigerator ice maker not working, you’ll need to call an appliance repair specialist to check out your refrigerator.